Do your kids get restless while traveling in the RV? This list of RV friendly craft ideas will help keep them busy and out of your hair. Traveling with younger children is always a bit of a challenge. However, when you’re traveling in an RV? You want to be able to find ways to keep your children busy and entertained (and to prevent them from asking “Are we there yet?” one more time.) However, you also don’t want to have to spend half of your vacation time picking up after their crafting decisions. Before you cancel your trip, read this post. We’re sharing our best RV friendly crafting ideas with you and your family. When you’re in the market for RV friendly crafting ideas, your main priority is looking for options that will keep your kids entertained and won’t have you cleaning up for hours afterward. One of the best solutions? Origami, which requires nothing more than paper, a YouTube tutorial or other how-to instructions, and a whole lot of patience. Your child can learn the art of paper folding without getting glitter and glue all over the interior of your RV. Plus, they can also create affordable and handmade zoo animals, hearts, and much more. This means that they’ll have toys to play with throughout your journey, and you’ll save tons of money in the process. One of our favorite creatures to fold is the traditional bird. Get inspiration and instructions from this list of the top origami bird creations to inspire your child at any level of folding experience. Another RV friendly craft that won’t break the bank or cause you to spend half of your vacation scraping craft glue off of your furniture? All you need is string, a few awesome beads, and maybe a kid-friendly plastic needle to help with the threading. Encourage your child to express themselves by stringing together lots of different colors and shades. You could even “commission” them to make you something special to wear around the campfire. Now, we know what you’re thinking: how can I prevent these beads from ending up all over the floor? You can store beads and other supplies in Tupperware, or even old baby food jars if you’re looking for a more eco-friendly option. Then, you can use a beading tray or board to help your child to string out and design their jewelry. Many of these trays also come with a cover, so you can click it shut and avoid disaster if you’re going over any bumps in the road. Do your research online before your trip starts to gather inspiration, and even bake some clay beads so your child’s necklace will be all their own! Continuing on our theme of paper crafts that are RV friendly (like the origami example above) let’s talk about another favorite: paper chains. Especially if you’re on the road frequently, it can sometimes be tough for your kids to feel like their space is their own. They don’t have a “room” to decorate with stickers or line with posters. So, give them the next best thing — the ability to decorate a tiny section of your RV with paper chains! To avoid a mess, we suggest cutting the strips of colorful cardboard paper ahead of time. You can also look for tape dispensers that give out smaller strips of tape to loop the chains together, mess-free. If your child is old enough, of course, they can also use a stapler. In addition to standard paper chains, we also love the idea of making this paper chain caterpillar. Invest in some googly eyes for a truly fun look! When all else fails, the truth is that few RV friendly crafts work as well as the classic coloring book. They entertained you as a child for hours on end, and we’re confident that they’ll be able to do the same for your kids. Make sure to get a variety of coloring books, so that kids don’t get bored. Get themes related to their favorite cartoon characters, books, or even toys. To keep them guessing, pick up lots of different drawing materials. We love the fun look of glitter pens, stamp markers, and colored pencils. To make sure your children know that you appreciate their artwork, hang up a few of your favorites around your RV’s interior. If your child is a little bit too old for coloring books, but still enjoys painting and drawing? Maybe it’s time for them to graduate to paint by numbers! They can choose to copy famous paintings, landscapes, or even their favorite mythical creatures! To avoid a mess, use basic watercolor paint on the canvases. These are especially awesome activities to do outside in the sunlight when you’re camped out for the afternoon. Then, let them dry on the picnic table. 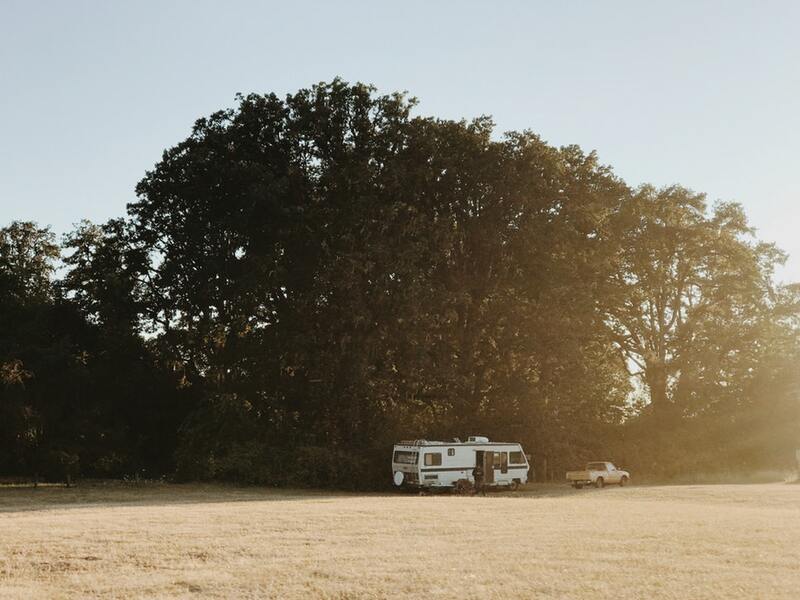 Want More RV Friendly Lifestyle Ideas? We hope that this post has helped you to realize that it is possible to find affordable and fun RV friendly crafting ideas for children (and yes, even adults) of all ages. From creating paper chain creatures to encouraging your child’s inner artist with coloring books and paint by numbers, the possibilities are limitless. Of course, we know that you also need lots of other advice on how to cook, clean, and generally get the most out of the camping lifestyle. Spend some time on our website and blog to get access to how to conquer and thrive in the nomadic lifestyle!